August 28 is International Read Comics in Public Day! I'm doing my part to support International Read Comics in Public Day. Won't you help, too? The concept is fairly simple: we’re asking that everyone take an hour or two out of their day on August 28th (also the birthday of Jack “King” Kirby, incidentally) to read a comic book in a public setting–a park bench, a beach, a bus, the front steps of your local library (we do ask, however, that you be mindful of local loitering laws). Let strangers see you reading a piece of sequential art. 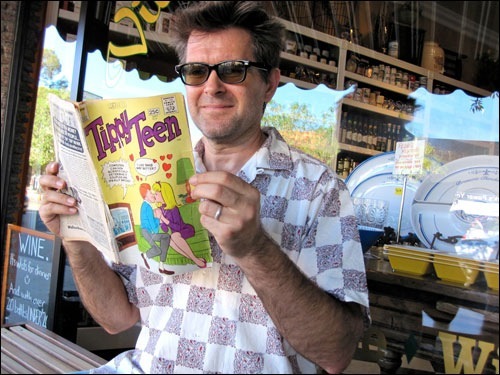 [Mark's] comic of choice is Tippy Teen, a late-60s Archiesque Tower Comics series by Jughead artist, Samm Schwartz. If you look closely at the cover of this $0.25, Comics Code-approved issue, you’ll notice a prescient warning about the dangers of online dating. If you look to the left of Frauenfelder, you’ll see a sign that reads, “Wine. It’s what’s for dinner.” Coincidence? Perhaps.